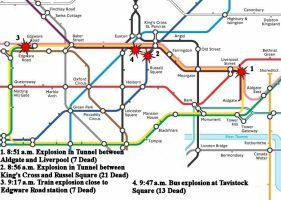 On 7 July 2005, a series of roughly simultaneous bombings occurred on the London public transport system. Four explosions occurred, with three taking place in the London Underground and one on a bus. Three bombs exploded in the underground at 8:50 AM GMT, with the bus bombing occuring roughly an hour later. As of 18 July 2005, the official death toll in the incident was 56, including the four suicide bombers. This contrasts the previous figures of: 3:25 PM GMT on 7 July 2005, British authorities confirmed there to be at least 33 dead. At the same press conference, 45 people were said to be seriously injured with another 300 sustaining minor injuries; 6:13 PM GMT on 7 July 2005, London Deputy Assistant Police Commissioner Brian Paddock listed 37 fatalities and 700 injuries, with 300 of the injuries requiring hospitalization. Investigation by UK authorities revealed four suicide bombers responsible for the attacks. It was initially reported that all four of the men were British citizens of Pakistani descent: Hasib Hussain, 19, Shehzad Tanweer, 22, and Mohammed Sadique Khan, 30. The fourth had yet to be named but it was later revealed that he was 19 year old Germaine Lindsay, a man of Jamaican birth. All four men were from the county of West Yorkshire. The four men were identified on closed circuit television at the King's Cross Station at 8:30 AM GMT on 7 July 2005 carrying rucksacks that most likely contained the bombs used in the attack. In addition, significant evidence such as identity documents belonging to the suspects were found at the scenes of the bombings. Three of the suspects traveled to Pakistan in 2004 under the guise of seeking Islamic education. Khan and Tanweer traveled together to Karachi on 19 November, returning to the UK on 8 February. Hussain traveled to the country in July 2004. Pakistani intelligence suspected the men sought out contacts with the violent Muslim extremist groups Lashkar-e-Taiba and Jaish-e-Mohammed. Both groups are known to have connections with the al-Qa'ida network. Under the Terrorism Act of 2000, UK Metropolitan Police carried out six searches in West Yorkshire connected to the investigation on 12 July 2005. Also, two cars in which the suspects traveled from West Yorkshire to Luton, near London, were searched. Explosive devices were found in one of the cars used by the suspects. In addition to the four deceased suspects, another suspect believed to be related to the others was arrested in West Yorkshire. The suspect arrested on 12 July remained in detention as of 18 July after police were granted a warrant to continue holding the man. The warrant authorized the jailing of the 29 year old man until 19 July. He was held under suspicion of the commission, instigation or preparation of acts of Terrorism under the Terrorism Act of 2000. By 18 July 2005, a total of ten searches had been conducted in West Yorkshire and a further address had been searched in Aylesbury, Buckinghamshire. Eight of the searches were still classified as ongoing. As of 13 July 2005, the investigation was continuing, with the focus centered on a possible mastermind of the attack. Several days later, UK Metropolitan Police commissioner Sir Ian Blair stated that the bombers were suspected to be only the "foot soldiers" of the plot and reconfirmed the focus of the investigation was the search for anyone responsible for planning and financing the attacks. It is possible that there was a more experienced terrorist responsible for recruiting the suspects and working out the details of the attack. Also, this manager could possibly be a foreign actor with developed links to the al-Qa'ida network. Al-Qa'ida's modus operandi in the past has included the recruitment of citizens of the target country. In Cairo, Egypt on 15 July 2005, a Britain-educated Egyptian chemist was arrested in a raid by Egyptian authorities. Magdi Mahmoud al-Nashar, 33, was wanted for questioning by British authorities in relation to the bombings. Al-Nashar was linked by the investigation to the attacks by a house in Leeds, although his exact involvement in the plot was unclear and he was not officially named as a suspect. His apartment in the UK was still furnished, but colleagues reported he had not been seen since early July. He was being questioned by British agents in Cairo following his arrest. A Reuters report on 11 July 2005 quoted French and British intelligence officials with further information on the bombings. The sources explained their primary suspicion that the attack was carried out by a local cell of Islamic extremists, who possibly had assistance from a larger foreign based network. A few forensic details of the attack were also revealed. The bombs themselves each contained roughly 10 lbs. of military grade high explosive, compared to to the 22 lb. bombs used in the Madrid attacks of 11 March 2004. A massive investigation was still ongoing to determine who was responsible for the attacks. Prime Minister Tony Blair said in a statement on 11 July 2005 that "Islamic extremist terrorists" were responsible for the attack, but did not provide any further details on the matter. Although initially the attack could not be attributed to one specific group, it bore characteristics of an attack by Islamic extremists, possibly related to the al-Qa'ida movement. A message posted on an internet message board claimed responsibility for the attack in the name of a previously unknown group, the "Secret Organization of al Qaeda in Europe". Islamic extremist groups often claim responsibility for attacks with aliases, so it is possible that this attack was committed by a group that had been previously identified under a different name. Also, the message was unable to be verified as true as it was not posted on a site used by al-Qa'ida in claiming attacks in the past. Furthermore, no link to al-Qa'ida could be confirmed at the time. It was reported that several known al-Qa'ida sources had released messages of support however. "In the name of God, the merciful, the compassionate, may peace be upon the cheerful one and undaunted fighter, Prophet Muhammad, God's peace be upon him. God says: 'You who believe: If ye will aid (the cause of) Allah, He will aid you, and plant your feet firmly.'" The statement draws a connection to the UK's participation in the US-led coalitions in Afghanistan and Iraq as the motive behind the attack. Beyond the UK, the missive threatened the countries of Denmark and Italy with future attacks for their participation in US efforts. Statements surrounding the 11 March 2004 attacks on the Madrid subway system claimed to be motivated by Spain's participation in the Iraq war. The attacks took place on the eve of national elections that brought a government opposed to Spanish participation in the war into power.